Lbd is a wardrobe staple for women. It is rightly said ‘one is never overdressed or underdressed with a Little Black Dress’. Whenever you have to attend a party or any event in the evening and you don’t have much time to decide on your outfit or there are some days when you are not in a mood to experiment a lot with your outfit, for those days lbd is the safest option. You can never go wrong with lbd. Though I like to play with different colours in my wardrobe, I’m biased towards black. I never get bored wearing black. Black colour leads my wardrobe. 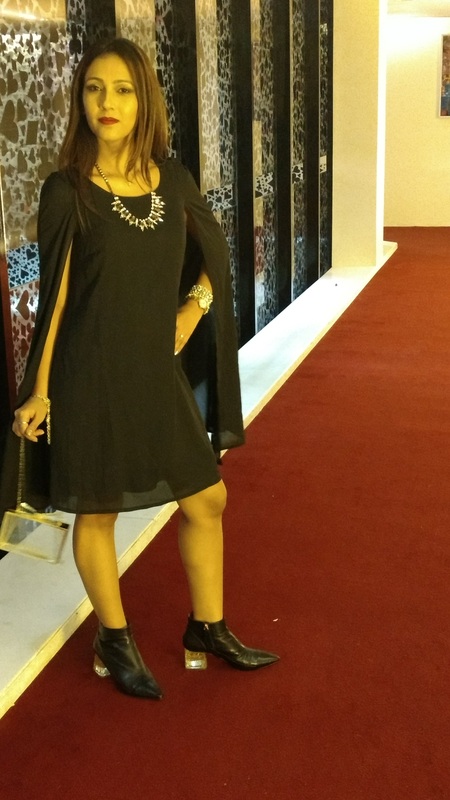 I would like to share with you all how I styled my cape lbd which I wore for my cousin’s birthday party @TheDeltin, Daman. I bought this beautiful black cape lbd online from ridress.com. A week before the party, I had undergone a surgery. So I was not in a mood to experiment a lot and wanted to wear something which would be loose over my tummy. 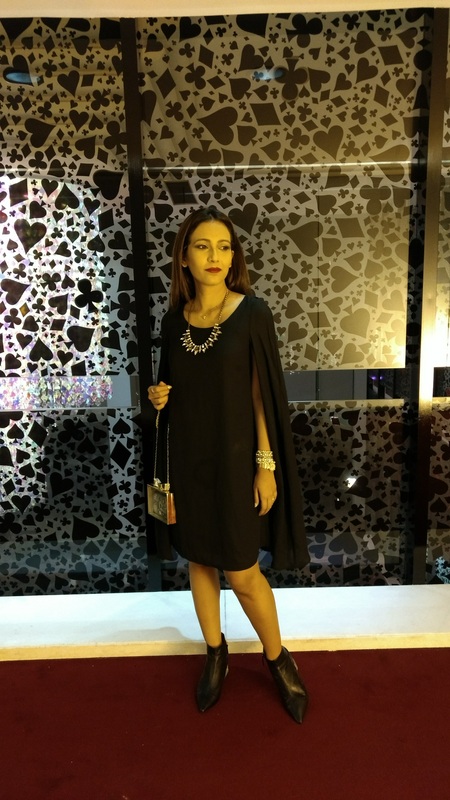 I chose to wear this cape lbd with relaxed fit. It was really comfortable and cozy because of the fit and the cape. I teamed it up with zara black boots with clear heels and a clear clutch from accessorize. These days I’m in love with clear accessories. I looking forward to buy some more ‘clear accessories’. 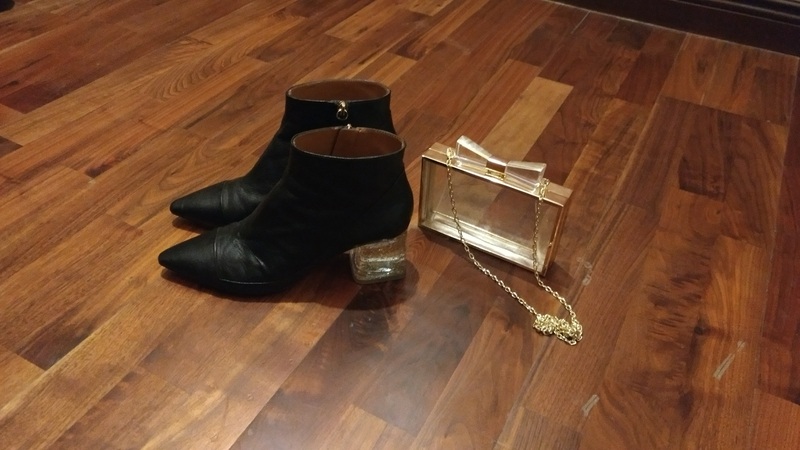 Those boots are with box heels which are broader on the lower part, so are super comfortable to walk and what I loved most is gold sparkles in the heels. I accessorised it with a statement necklace and a bracelet. Completed the look with red1 shade of maybelline lipstick (LIP gradation by COLORsensational). I’m in love with this series. I even bought other colours of these. It’s matte, highly pigmented and glides well on the lips giving smooth finish. I created classy look with my lbd. But you can add pop of colour in your accessories and create fun look. Instead of statement necklace, you can wear big earrings or just keep it simple with no or minimal accessories and wear dressy embellished shoes. You can go for any footwear with nice heels like pumps, stilettos, wedges. For more sophisticated look you can add a belt. Lbds are truly versatile. 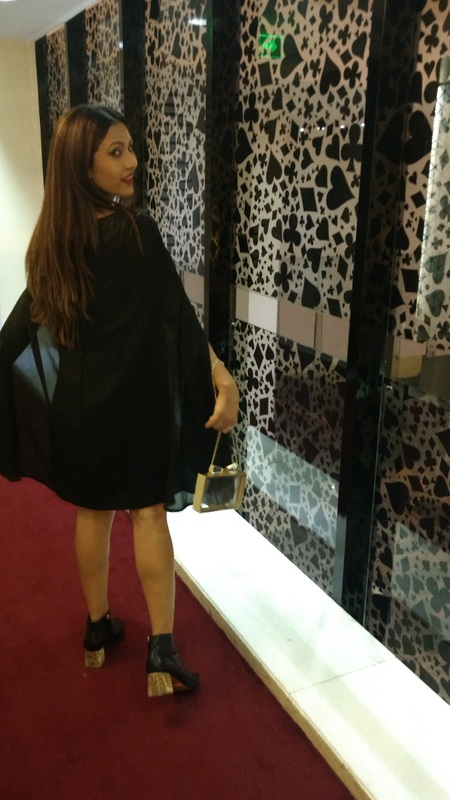 Did you all like how I styled my cape lbd?…..Tell me how would you like to style your lbd? Previous postGrand canyon of Maharashtra- Nighoj potholes aka Ranjankhalge!!! Next postSTAY ROOTED, WEAR ROOTED!! !